Construction of the Main Lodge began in 1928 and was completed in 1929. The Lodge was built during the ownership of Mark and Alice Shanks. Logs used in construction of the Main Lodge were cedar brought to the property from a swamp located approximately seven miles from Republic. The Logs were forded upriver from the existing bridge spanning the Michigamme River and then brought back to the building site. The Main Lodge was built with a crew of nine to ten men under the supervision of Mike Jarvi from Republic. The Garage, Tool Shed and Plumbing Shed were built at the same time as the Main Lodge. The project was delayed for a period of time after construction began due to an argument between Mike Jarvi and the Shanks as to whether tools could be sharpened during working hours. When the Lodge was almost completed Mr. Shanks was unhappy with the pitch of the roof. The entire roof was removed and replaced with a roof having greater pitch. In the 1990’s the Hurst’s insulated the roof allowing the Lodge to be kept open throughout the year. Originally the exterior of the logs was unfinished. Each summer, linseed oil was applied to the exterior of the logs. In the early 1950’s Martin and Elma Granholm applied creosote to the exterior giving the logs a blackish appearance. In the 1990’s the Hurst’s began stripping off the creosote finish and applying Sikkens natural stain giving the lodge its current honey color. The stones for the large fireplaces came from iron ore mines in the area. Elaborate rock gardens were constructed. When the main lodge was constructed there was a water well in the basement and water was also pumped directly from Juncob Lake for a variety of uses. The well in the basement went dry and another well was placed east of the main Lodge. When the second well went dry the current well was drilled along the road between the Main Lodge and the River Cabin. It was necessary to place the existing well at its current location due to problems with iron ore sediment in the other test holes. Water is pumped several hundred feet from the well pit to the Main Lodge. In the early 1920’s, prior to construction of the Main Lodge on Juncob Lake, the Lodge which is now the Andersen property (Pinecrest) was constructed on the west side of the Lake. The large white ring leaning against the wood shed (it use to sit near the sidewalk leading to the Main Lodge) is the driving rim of a steam locomotive. The rim weighs 525 pounds and was purchased by the Shanks in the mid-1930’s from a roundhouse in Chicago. The River Cabin was built by the Shanks in 1936. It is made of pine logs hauled across the recently completed bridge. The pine logs came from an area along the Black River. The exterior of the logs was painted, not creosoted. The original kitchen was reduced in size in the mid-1950’s when the Granholm’s abandoned the outhouse and installed an indoor toilet. The interior of the River Cabin was gutted and rebuilt in the late 1990’s by the Hurst’s. 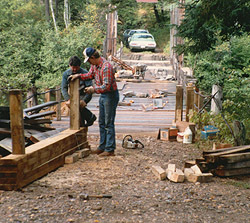 The bridge was constructed after the completion of the Main Lodge (1928-1929) and prior to the construction of the River Cabin (1936). Construction of the bridge started shortly after the 1929 stock market crash. The bridge was constructed by a crew of ten to twelve men under the supervision of Bill Kerkela from Republic. Norway pine was used for the supporting pilings. The pilings were driven into the river bed with a pile driver. Construction of the bridge took approximately three months. The bridge was completed without construction of any cribs. Initially the bridge consisted simply of eight Norway Pine pilings at each support point. In the 1950’s the cribbing was constructed around the pilings to prevent damage from ice and debris moving downstream. In 1968 repairs became necessary when a heating oil truck broke through rotting decking and support timbers. The rotted timbers where replaced with steel I-beams acquired from a salvage company near Ishpeming. Additional timbers for the 1968 repairs came from a mine in Escanaba which was being dismantled. The 1968 repairs were done by Ed Niemi of Republic. In 1983 repairs were made under the supervision of Vincent “Red” Nicklas. The cribbing was shored up with timbers and cable. Red and a crew of four to five men also leveled the steel I-beams, added aggregate to the cribs and replaced decking where necessary. In 2002 major repairs were performed by Moyle Construction from Houghton. The bridge was leveled and the deck raised approximately 18 inches. The steel I-beams were replaced and upgraded, the cribbing was further supported with grout being pumped into the cribbing and concrete caps poured on top of the cribs. The deck was completely replaced and bolted to the I-beams. Construction began in November and was completed in early January. Mother nature assisted by providing very mild early winter temperatures. Prior to the construction of the bridge access to the property was via a scow which crossed the Michigamme river near the current bridge on the Andersen property. One would simply pull the scow across the river on the cable and walk the rest of the way. The cable scow provided access to both the Shank and Berz/Andersen property. Apparently a dispute about a Poodle arose between Mr. Berz and the Shanks. The Poodle, owned by Mr. Berz paid numerous unwelcome visits to the Shanks. On one such occasion the Shanks caught the dog and allegedly gave it a shot of turpentine. From that point on the Shanks and their guests were denied permission to use the scow. The bridge was constructed shortly thereafter. Years ago there was a railroad bridge which crossed the Michigamme River midway between the CedarHurst and Andersen bridge. The railroad bridge serviced an iron ore mine located just north of the CedarHurst property. In May 1985 and 2001, the Michigamme River flooded due to fast melting snow pack. The water level crested above the deck of the bridge and resulted in two feet of water in the basement of the River Cabin. The road to Republic was underwater and impassable. In the 2001 flood a boat house along the river just north of the bridge was lifted off its foundation and began floating down the river toward the bridge. The boathouse was chained to a tree until the flood waters receded, then removed. The site of the old boathouse has been converted into a boat launch. The Shanks, owners of the property at the time of all construction, stayed on the property approximately two months every summer. The Shanks owned Shanks Standard Ice Cream Company, Chicago. In 1941, The Michigan Department of Conservation, at the request of the Shanks, stocked Juncob Lake with 200 Largemouth Bass Fingerlings and 10,000 blue gill fingerlings. Prior to the stocking Northern Pike was the predominate species in Juncob Lake. The sauna was constructed in the 1950’s. The property has never been mined or logged commercially. The Shanks built a boccie court behind the plumbing shed. Boccie (also spelled bocci or bocce) is a game of Italian origin similar to lawn bowling. The Andersen property (Pinecrest) on the west side of Juncob Lake was formerly owned by a man named Berz, who lived there for approximately 25 years. Mr. Berz bought a farm, moved to Eagle River, Wisconsin, and sold the property. Mr. Berz built the original improvements on the Pinecrest property. He raised horses and grew hay for his horses in the meadow located between the River Cabin and the Andersen buildings. The dilapidated logging wheel located along the road between the River Cabin and the Main Lodge came from the town of Michigamme. The Shanks bought it in rotten condition in the early 1930’s. Mike Jarvi, the foreman for construction of the Main Lodge rebuilt the wheel shortly after it was acquired by the Shanks. The “island” upriver from the CedarHurst bridge (now a peninsula) was previously owned by a Finnish minister. Finish churchgoers from Republic would row up the Michigamme River from Republic for church gatherings on the “island”. In the mid-1950’s the Granholms built a dock on the edge of Juncob Lake. The original dock was replaced in 1983 by Vincent “Red” Nicklas. In the late 1930’s the Shanks built a cedar boathouse near the existing dock. The Shanks had a 16 foot motor boat which they housed in the boathouse. The boathouse’s concrete remains can be seen in the shallow water along the edge of Juncob Lake. The boathouse burned several years after construction under mysterious circumstances. In the early 1930’s there was an icehouse built into the bank at the edge of Juncob Lake immediately behind the Plumbing shed. It was filled each winter with blocks of ice cut from Juncob Lake. The bulk of the information in this historical sketch came from Mr. Earl “Pogy” Mattila, Republic Michigan and compiled through interviews by Roger Ritzman of Wheaton, IL. Pogy worked for Mr. Berz for three years in the late 1920’s as a caretaker. 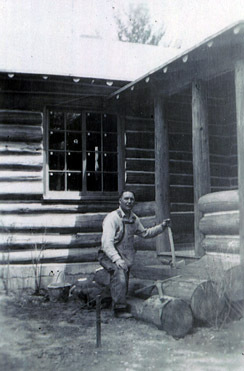 Pogy was hired by the Shanks in 1929 to help complete work on the Main Lodge. Pogy worked on the finishing touches such as varnishing, painting and chinking. Thereafter Pogy was caretaker for the Shanks and maintained the property as the Shanks’ summer home. Initially Pogy lived in what is now the Tool Shed. Pogy married and then lived in the River Cabin until he got a job working in the iron ore mines. Included in Pogy’s duties was hauling of guests back and forth across the Michigamme River using the cable and scow. Pogy declined comment as to the source of the turpentine in the Poodle incident.